The Document Inspector found one or more scenarios in your workbook that were defined by using Scenario Manager. Scenarios may contain cached or hidden data in your workbook. The Document Inspector can't remove these scenarios for you. Go to the Scenario Manager to remove scenarios manually. 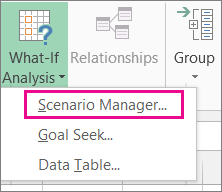 Click Data > What-If Analysis > Scenario Manager. In the Scenarios box, select the scenario you want to remove and click Delete. Do this for each scenario you want to remove. Repeat steps 2 and 3 for each worksheet in your workbook. After closing Scenario Manager, run the Document Inspector again to verify the issue is resolved.